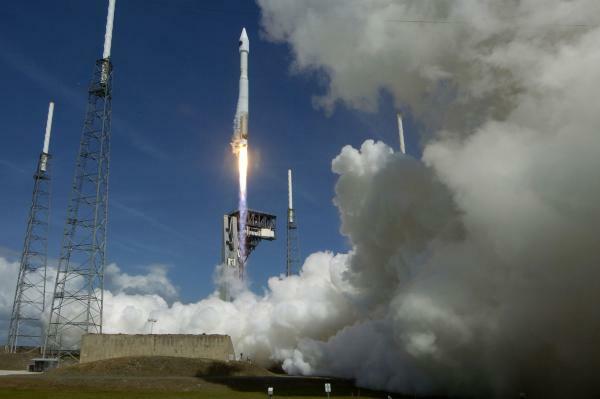 April 13 (UPI) — The United Launch Alliance’s Atlas V rocket is scheduled to launch a pair of payloads for the U.S. Air Force on Saturday night. The rocket is set to blast-off at 7:13 p.m. ET from Space Launch Complex 41 at Cape Canaveral Air Force Station in Florida. The Air Force Space Command mission, AFSPC-11, features two spacecraft. The primary payload is the Continuous Broadcast Augmenting SATCOM, or CBAS, a geostationary communications satellite. The satellite will lend communications support to the Air Force, relaying messages between leaders back at base and commanders in combat. “The mission of CBAS is to augment existing military satellite communications capabilities and broadcast military data continuously through space-based, satellite communications relay links,” the U.S. Air Force said. Behind the CBAS payload is EAGLE, the ESPA Augmented GEO Laboratory Experiment. EAGLE is a platform capable of releasing several secondary payloads into space. According to Gunter’s Space Page, EAGLE is carrying five additional payloads, all experimental satellites. They secondary payloads include: the Hypertemporal Imaging Space Experiment, HTI-SpX; MYCROFT; the Compact Environmental Anomaly Sensor III Risk Reduction, CEASE-III-RR; the Inverse Synthetic Aperture Ladar, ISAL; and the AFRL-1201 Resilient Spacecraft Bus Development Experiment, ARMOR. The HTI-SpX will help researchers with the Air Force better understand hypertemporal imaging, the technique of combining images of different parts of Earth at different spectral bands taken over time. ISSAL will tests new technology for capturing high resolution images of objects in geosynchronous Earth orbit. Atlas V is ULA’s most powerful and reliable rocket. It is the rocket the U.S. military calls on for launching top-secret payloads. Saturday’s liftoff will be the 8th for the Atlas V 551, the latest iteration of the Atlas V, and the 77th for the Atlas V rocket family. Engineers completed preliminary checks of the rocket’s systems on Friday afternoon. More checkups and additional fueling will occur in the lead up to liftoff. “On launch day, high pressure continues to migrate east as the aforementioned cold front advances into the Gulf Coast states in the morning and near the Florida Panhandle during the window,” the Air Force wrote in its latest weather outlook. Live coverage of the rocket launch will be available on ULA’s website.